Kahlil Joseph’s FLY PAPER—now on view at MOCA/PDC in West Hollywood—is a companion piece to ONE DAY AT A TIME—MANNY FARBER AND TERMITE ART downtown. MOCA Pacific Design Center, 8687 Melrose Avenue, West Hollywood. Kahlil Joseph, Fly Paper, 2017, featuring Ben Vereen. Images courtesy the artist and MOCA. This entry was posted in ART, FILM and tagged Ben Vereen, Fly Paper (Joseph), Kahlil Joseph, MOCA Pacific Design Center on November 17th, 2018 by Barlo Perry. ​Simon Doonan—author and window-dresser-for-Barneys nonpareil—will be in Los Angeles this weekend to give a talk on the life and times of his friend, the late artist Mundo Meza (1955–1985), with whom Doonan collaborated on window displays at such West Hollywood boutiques as Maxfield Bleu. 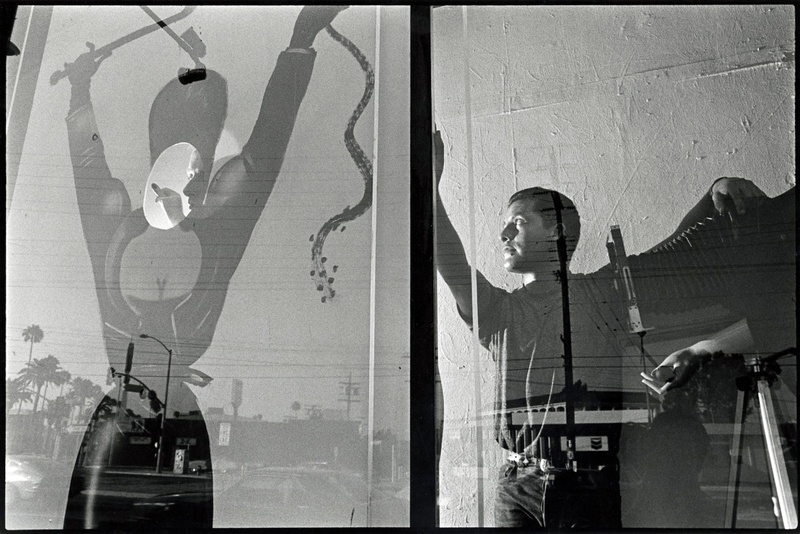 Doonan’s talk is part of the ongoing PST: LA/LA exhibition AXIS MUNDO: QUEER NETWORKS IN CHICANO L.A. This program is presented in collaboration with ONE National Gay & Lesbian Archives at the USC Libraries with the support of the City of West Hollywood’s WeHo Arts program. SIMON DOONAN ON MUNDO MEZA, Sunday, Nov 19, 2017 at 3 pm. CITY COUNCIL CHAMBERS, 625 North San Vicente Boulevard, West Hollywood. AXIS MUNDO: QUEER NETWORKS IN CHICANO L.A., though December 31. MOCA PACIFIC DESIGN CENTER, 8687 Melrose Ave, West Hollywood. ONE ARCHIVES GALLERY, 9007 Melrose Avenue, West Hollywood. Simon Doonan (left) and Mundo Meza at Maxfield Bleu, West Hollywood, in the early 1980s. Photograph by Wayne Shimabukuro, from the collection of Jef Huereque. This entry was posted in CONVERSATION, DESIGN, EDUCATION/ACTIVISM, FASHION and tagged Axis Mundo—Queer Networks in Chicano L.A., Jef Huereque, MOCA Pacific Design Center, Mundo Meza, Pacific Standard Time: LA/LA, Simon Doonan, Wayne Shimabukuro on November 17th, 2017 by Barlo Perry. AXIS MUNDO—QUEER NETWORKS IN CHICANO L.A. is a PST: LA/LA exhibition exploring the links between queer Chicano artists and their collaborators from the late 1960s to the early 1990s. Paintings, drawings, videos, artists’ magazines, mail art, flyers, and other ephemera by Skot Armstrong, Vaginal Davis, Mundo Meza, Tomata du Plenty, Teddy Sandoval (Butch Gardens School of Art), Joey Terrill, Jack Vargas (Le Club for Boys), and more are on view at MOCA Pacific Design Center and the ONE Archives Gallery through the end of the year. AXIS MUNDO is organized by David Evans Frantz and C. Ondine Chavoya, in collaboration with MOCA, Los Angeles. AXIS MUNDO—QUEER NETWORKS IN CHICANO L.A., through December 31. Patssi Valdez, Portrait of Sylvia Delgado, circa early 1980s. Hand-painted photograph with ink and pastel, 20 x 36 in. (50.8 x 91.4 cm). Courtesy of Patssi Valdez. Photograph by Ian Byers-Gamber. Harry Gamboa Jr., Roberto Gil de Montes, 1978. Gil de Montes shown with his work Tongue Tied in the No Movie exhibition at LACE, May 2–31, 1978. Chromogenic print, 14 x 11 in. (35.6 x 27.9 cm). © 1978, Harry Gamboa Jr.
Gerardo Velázquez, The Neglected Martyr, 1990. Acrylic on canvas, 80 x 66¼ in. (203.2 x 168.3 cm). Gift of the Nervous Gender Archive to the ONE National Gay & Lesbian Archives at the USC Libraries. Photograph by Fredrik Nilsen. This entry was posted in ART, EDUCATION/ACTIVISM and tagged Axis Mundo—Queer Networks in Chicano L.A., C. Ondine Chavoya, David Evans Frantz, Gerardo Velázquez, Harry Gamboa Jr., Jack Vargas, Joey Terrill, MOCA Pacific Design Center, Mundo Meza, ONE Archives Foundation, Pacific Standard Time: LA/LA, Patssi Valdez, Skot Armstrong, Teddy Sandoval, Tomata du Plenty, Vaginal Davis on September 14th, 2017 by Barlo Perry.